A beautiful and stunning creations, all soft and gentle. A beautiful card. I love the blue and the lace is gorgeous. This is gorgeous Sassy, I love the colour and all the beautiful detailing. 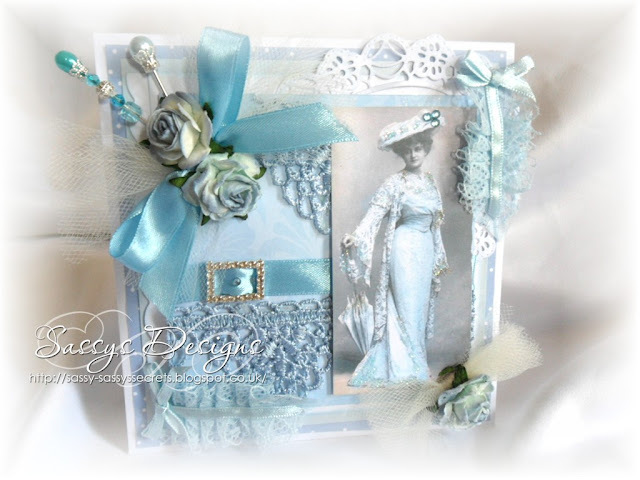 Oh Sassy hun this is NEVER OTT its blooming gorgeous as stunning as always love your yummy vintage creations.. This is not OTT or pants,its beautiful, (you dont like it cos it aint pink) I like the blue lace the images and those gorgeous pins! how wonderful, my lovely!! HRH put the sunglasses on and is now staring at your blue card, wowzer, it's so ... well..erm... BLUE!! LOL...no honestly, I love it! I just love this color blue! This looks so delightful, you have to smile and think of the soft blue of the summer sky! Just beautiful, dear Sassy! don't be so critical of your creations - it's gorgeous! and love all the lace! Sassy, I think it is fabulous. So vintage looking. I love your elegant style.